Legal systems do not operate in isolation but in complex cultural contexts. This original and thought-provoking volume considers how cultural assumptions are built into American legal decision-making, drawing on a series of case studies to demonstrate the range of ways courts express their understanding of human nature, social relationships, and the sense of orderliness that cultural schemes purport to offer. Unpacking issues such as native heritage, male circumcision, and natural law, Rosen provides fresh insight into socio-legal studies, drawing on his extensive experience as both an anthropologist and a law professional to provide a unique perspective on the important issue of law and cultural practice. The Judgement of Culture will make informative reading for students and scholars of anthropology, law, and related subjects across the social sciences. 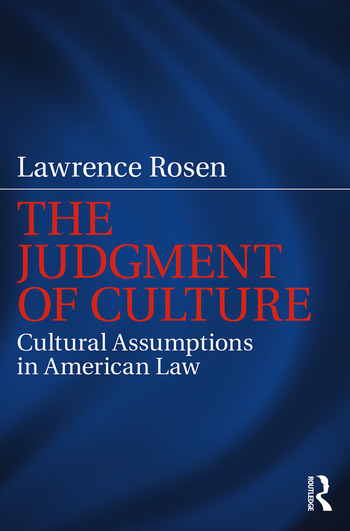 Lawrence Rosen is the William N. Cromwell Professor Emeritus of Anthropology at Princeton University, USA, and Adjunct Professor of Law at Columbia Law School, USA. As an anthropologist he has worked on Arab social life and Islamic law; as a legal scholar he has worked on the rights of indigenous peoples and American socio-legal issues. He is a member of the bar of the State of North Carolina and the U.S. Supreme Court.